Live Blogging from the tournament starting at 1 PM Eastern. Jose Padilla has been found guilty in court and faces possible life in prison, but forensic psychiatrist Dr. Angela Hegarty explains after interviewing him that Padilla already paid the ultimate price through torture -- he's lost his mind. The number of U.S. troops in Iraq could jump to 171,000 this fall — a record high for the war — as military leaders expect stepped-up insurgent attacks timed to a progress report from American commanders in Baghdad. Vladimir Putin today ordered the Russian air force to resume the cold war practice of long-range flights by strategic bombers. Americans may need passports to board domestic flights or to picnic in a national park next year if they live in one of the states defying the federal Real ID Act. For years, the military has been warning that soldiers' blogs could pose a security threat by leaking sensitive wartime information. But a series of online audits, conducted by the Army, suggests that official Defense Department websites post material that's far more potentially harmful than blogs do. ESPN.com took the top prize in the Military Reporters and Editors annual journalism awards for its investigation into the death of former NFL star Pat Tillman, who died at the hands of friendly fire in 2004 while serving in Afghanistan. Jenna knocked up by Elmo? In response to many requests - and not only from the US - here are most of the prominent names to date in the primaries. If your favourite is not yet included, please remember that we'll be adding others along the way. We'll also be charting the presidential candidates for all the parties when the race begins. Please keep in mind that The Political Compass is a universal tool, reflecting the full spectrum of political thought, and applicable to all democracies. US politics are generally fought within a more confined space. 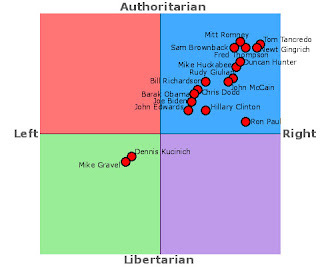 While in mainstream America, Clinton, for example, may be seen as left leaning, in the overall political landscape, she is a moderate conservative. Someone like Kucinich, while seen by his severest opponents as an extreme left winger, would qualify as a typical social democrat in a European context. My score of -8.50, -6.41 severely limits my choice of candidates. Via Blast Off!. First seen at Crooks and Liars. Karl Rove, President Bush’s close friend and chief political strategist, plans to leave the White House at the end of August, joining a lengthening line of senior officials heading for the exits in the final 1 1/2 years of the administration. Where once the war in Iraq was defined in conversations with these men by untenable ideas - bringing democracy or defeating al-Qaeda - these days the war in Iraq is defined by different ways of expressing the idea of being weary. It is a theme that is endlessly reiterated as you travel around Iraq. 'The army is worn out. We are just keeping people in theatre who are exhausted,' says a soldier working for the US army public affairs office who is supposed to be telling me how well things have been going since the 'surge' in Baghdad began.